Inland Seafood engaged id8 to revive the Woodsmoke Provisions brand. The prior brand look dated and their goal was to maintain the name Woodsmoke Provisions and create a new identity that was synonymous with fine, artisan smoked seafood. With numerous competitors, Inland Market understood that their new product line had to stand out in an already crowded marketplace. 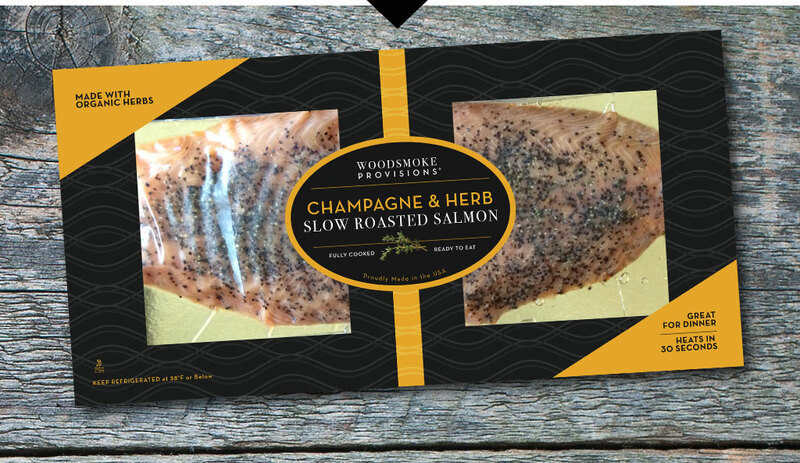 High-end packaging designs positioned Woodsmoke Provisions as the product choice among “foodies” and chefs while entertaining in their homes. id8 selected a black and gold color palette to create a rich look that differentiates Woodsmoke Provisions from competitors who traditionally use blue color palettes. The use of natural ingredients like a sprig of rosemary, although a simple element, help to show the delicious flavor profiles of the smoked salmon. and has been well received by consumers. new flavor profiles to Costco this Spring/Summer.